In mid May Blackboard appointed Ray Henderson as the new President of the Blackboard Learn division, one of the most respected people in the ed tech field and someone totally committed to openness. At the time Michael Feldstein set down three tests for the new Blackboard as an indicator of whether Henderson's appointment did mean real change in the company. The third test of whether whether Blackboard is serious about learning to be more open is whether they implement IMS LIS across all their LMS products. This is actually an area where neither company has delivered the goods yet (although, to be fair, both have publicly committed to doing so). LIS will make customers able to get higher quaility integration between LMS and SIS at lower cost. It will enable them to pay less to vendors in consulting fees and be more able to migrate from one platform to another." It's too early to tell yet (at least from the outside) whether he's made any difference but interestingly enough Ray Henderson has just started a blog, another I'll be adding to my newsreader. Michaell Geist reported last week that "the Canadian Patent Appeal Board recently denied an appeal by Amazon.com over a "one-click" ordering system patent with strong language that challenged the notion that business method patents are patentable under Canadian law." "The Group of 77 and China as well as several developing countries in their individual capacity have made proposals calling for climate-friendly technologies to be excluded from patenting. In their text submitted Wednesday, the G77 and China proposed that "All necessary steps shall be immediately taken in all relevant fora to mandatorily exclude from patenting climate-friendly technologies held by Annex II countries which can be used to adapt to or mitigate climate change". [Annex II of the Convention contains a list of 24 developed countries with financial obligations]. The "no patents" proposal is one of several other ambitious proposals put forward by developing countries to address the intellectual property barrier to the transfer of and access to environmentally-sound technologies for climate mitigation and adaptation (ESTs)." The greater proportion of such patents are currently held by commerical organizations in developed countries and the move is another indication that China really is getting serious about renewable energy. Thanks to Sangeeta Shashikant of TWN via the A2K list for the pointer. A study commissioned by the Strategic Advisory Board for Intellectual Property and conducted by UCL's Centre for Information Behaviour and the Evaluation of Research (CIBER) has suggested that "huge economic losses are being sustained due to large-scale unauthorised downloading, generated by widespread confusion about copyright law in the online world." Ben Goldacre was a little skeptical about the figures in the report when he reviewed it in the Guardian last Saturday but I still haven't had the chance to read the report in detail, so just noting it for the moment again. Update: Executive summary of the report available here. MPAA losing the public battle on copyright? Fritz Attaway of the MPAA seems to think they are losing the "public consciousness" battle on copyright. "”The enemies of copyright have really done a good job at creating the false premise that the interest of copyright holders and the interest of society as a whole are antagonistic, and they always talk about the need for balance,” said Fritz Attaway, executive vice president and senior policy adviser for the Motion Picture Association of America. “We have got to do a better job” at attempting approaches at copyright protection “in a way that we get paid but also that consumers can access our works,” he added." "”We’ve got to do more of that. We live in an age where we cannot block access to our content,” he said. “People are going to get it one way or the other. We would like them to pay for it and we need to seek out ways where they can pay for it. But just saying ‘no’ isn’t the answer.”"
It's a real pity the RIAA didn't realise this when they put so much energy into trying to ban technologies like the Rio and p2p. If the music industry had worked with the technology industry maybe they and not Apple would be monetizing whatever the equivalent of iTunes would have turned out to be - a cheap, legitimate, open standard, clean, reliable, convenient and easy to use online music retail service. I really like this - a former pharmaceutical executive, convicted of engaging in antitrust practices and lying about it to federal authorities, has been sentenced to write a book about it! The judge reckons it might be inspirational. ...with generic maker Apotex poised to offer a generic Plavix, the two companies struck a deal in which Apotex agreed to hold off on launching its generic in exchange for Bristol-Myers not selling a competing generic of its own down the road. Basically Bristol-Myers would get 6 more months to sell Plavix at pumped-up brand name prices (without generic competition) and Apotex could later sell generics without competition from Bristol-Myers. Sound fishy? The FTC thought so and rejected the deal out of antitrust concerns. So the two companies cut that part out of the written portion of their agreement, but Dr. Bodnar made an oral agreement with Apotex along the same lines. Still sound fishy? That's probably why Bristol-Myers didn't disclose the unwritten part of the deal to the FTC. When stories being told to the FTC didn't match up, Bodnar signed a statement indicating that no such side deal existed." Finding ways to extend the monopoly on commercially valuable drugs as they reach the end of their patent term is standard practice in the pharmaceutical industry, so it might be really interesting to read Dr Bodnar's book when it eventually does get published. Chris Edwards article Sweden's Pirate party sails to success in European elections is in this morning's Guardian. I've emailed Chris about this separately but the final quote attributed to me wasn’t entirely accurate. I can’t recall my exact words but what I was trying to say when we spoke – and I apologise to Chris and his readers if I wasn’t entirely clear - was that if people started to get cut off the Net for allegedly infringing copyright and if it started to affect thousands then it would get noticed; and because people now depend on the internet for everything from education and entertainment to employment, there might be a significant reaction. For the record, from my perspective it is highly unlikely we will ever get to the stage where tens of thousands of people get thrown off the net for alleged copyright infringement, certainly not in the UK. Lord Carter is threatening include provisions in his final draft of his Digital Britain report to "do something" about peer to peer infringement but the detail is pretty vague so far and in the UK we're nowhere near just one person getting permanently excluded from the Net for such activity. "The French Constitutional Council has ripped into the new Création et Internet law which would disconnect repeat online copyright infringers, calling the basic premise unconstitutional. "Innocent until proven guilty" remains a central principle of French law, and it cannot be bypassed simply by creating a new nonjudicial authority." Update 2: The Council of Europe has reportedly again declared access to the Internet to be a fundamental right. "Your genetic make-up can be used to tag you like a fingerprint, identify your children and categorise you according to your claimed genetic risk. The questions are: can you trust the genetic information you are given, is it good for health, and do the benefits outweigh the loss of privacy for individuals and their families? Tests that link your genetic make-up to your risk of future illness are unregulated and many companies are making claims about genetic risk that are completely false. Even valid claims are largely meaningless because genes are poor predictors of most diseases in most people, and not useful to decide who should give up smoking or eat a healthy diet. Testing healthy people’s genes suits commercial interests because rich, healthy people make a better market for health products than poor, sick people do. Personalised marketing of medicines, supplements and health scans to the worried well is the commercial aim. It also suits a wide range of industries to blame your genes, not their products or pollution, for your risk of cancer or obesity. Handing over our DNA to governments or companies may be good for them, but is it really good for us? There is no evidence that it will be good for health to medicate swaths of the healthy population based on misleading claims about genetic risk. Further, there is a real danger that this will divert precious NHS resources from treating people who are sick." We need more scientists with Dr Wallace's communication skills to engage in public debate in these areas to facilitate far wider understanding of the development of these kinds of technologies. 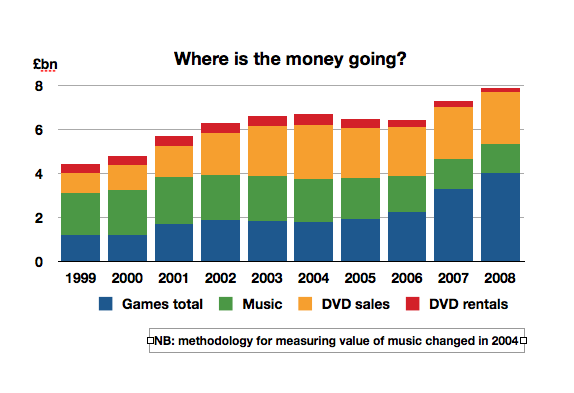 Are illegal downloads killing the music industry or is it games? Charles Arthur at the Guardian is wondering if illegal downloading is killing the music industry or are consumers spending their disposable income on some other forms of entertainment instead? ...I think they're spending the money on something else. What else, I mused, might they be buying? Hmm... young.. like the entertainment industry... ah, how about computer games and DVDs? " See also Illegal downloads and dodgy figures by Ben Goldacre in last Saturday's Guardian for some further analysis of the piracy by downloading figures. Arnold Schwarzenegger, governor of California, wants to phase out school textbooks because they are too expensive. "Arnold Schwarzenegger, California's Governor, announced this week that his state is about to phase out school books and substitute the internet in classrooms from the autumn, the news was presumably greeted with little more than a twitch of a baseball cap (turned backwards). Because California is close to bankruptcy, saving money is a priority, and this move will cut several hundred million dollars from the education budget. Mr Schwarzenegger also thinks that converting schools to online study will help to keep pupils more up to date, and that once textbooks are digitised they can be so easily revised that learning will always keep pace with progress." Firstly let's give the guy a pat on the back - he or his advisers think it might be a good idea to use the Net in education. Welcome to the 21st century Mr Schwarzenegger. Secondly let's tolerate his "Wayhay I've found the internet cure for our education woes" eureka moment. But somebody needs to enlighten him that believing the Net can directly and cheaply substitute for good textbooks (though from what Richard Feynman had to say about Californian textbooks might suggest I should drop the adjective there) is a solution to his problems which is simple, obvious and wrong. Don't get me wrong, as a technophile in a university that has wholeheartedly embraced multimedia technologies as terrific educational tools and environments, I know first hand (and have the scars to prove it) that the Net can be deployed to spectacular effect (and at large scale) in this context. However, it is not simple, it is not cheap, and by and large it facilitates entirely new approaches and compliments rather than substitutes for effective pre-internet age educational tools (like texts) and practices. And somebody approaching the use of the net in education with the idea that is a cheap and easy substitute will fail, create a lot of frustration and do a lot of damage. It ranks right up there with the 'computer in every classroom will cure education' meme from the 1980s and 1990s. "The former home secretary, Jacqui Smith, reached a "flawed decision" when she disregarded powerful medical evidence in the case of computer hacker Gary McKinnon, who is facing extradition to the US"
I've just had a chat with Chris Edwards for a Guardian piece about the success of the Swedish Pirate Party in the EU parliament elections. I've been off the grid for a couple of weeks so wasn't aware of the news until this morning. I had a relatively wide ranging chat with Chris but a few things initially came to mind when I came across the story. Firstly the Swedes have recently implemented the EU intellectual property rights enforcement directive, not a particularly popular measure, which coming rapidly in the wake of the Pirate Bay convictions would have helped the Pirate Party's publicity efforts in the run up to the election. Secondly Sweden has a relatively high proportion of broadband subscribers, a substantial minority of whom may be tuned into the intellectual property debates to a higher degree than elsewhere in the EU. I have no direct evidence of this at the moment - purely speculation on my part. Thirdly, as far as I can recall, Sweden had an electoral system based on proportional representation, which can make it possible for smaller parties to make an impact and gain seats with as little as 3 or 4% of the vote. Chris tells me they got 7% this time round which is pretty spectacular for a small single issue party. It would be interesting to get some direct evidence, through interviewing a statistically significant sample of voters who opted for the Pirate Party, to find out the key reasons for that support. It could really significant that 7% of the electorate might actually actively have been prepared to cast their vote based on the state of the IP landscape. Of course it could equally have been a simple protest vote against established parties with the Pirate Party being the one alternative where voters knew what it stood for. Or something more nuanced between the two.